New evidence of early human technological advancements dates to a period in eastern Africa when our ancestors faced an unpredictable environment and were evolving into Homo sapiens. S	S	tone Age tools were built to last, and many of their related technologies hold present day value. For example, the discovery around 320,000 years ago that obsidian, a type of glasslike volcanic rock, can produce ultra-sharp cutting edges is still a benefit today. Surgeons around the world often use obsidian scalpels, which are capable of cutting with greater precision than those made of steel. Obsidian also revolutionized the creation of other tools, including weapons. The hefty hand-axes associated with the Acheulean industries, which began over a million years ago, were gradually replaced with lighter-weight, razor-edged triangular points that could be hafted to wood or bone and projected through the air. "The world has never been the same since," Richard Potts, director of the National Museum of Natural History's human origins program, told Seeker. Potts has been leading the program's research in the Olorgesailie Basin of southern Kenya for 34 years in collaboration with the National Museums of Kenya. In three new studies published in the journal Science, he and his colleagues report evidence from this region of not only major technological changes, like the usage of obsidian, but also environmental and ecological changes that were also taking place before and during the period when Homo sapiens emerged. The changes coincide with the oldest known fossil record for our species in Africa, suggesting that the events were all driving forces in the evolution of Homo sapiens. The findings counter a popular theory about human evolution, which holds that our species gradually changed in response to environmental pressures caused by expanding, arid grasslands in Africa. The so-called savanna hypothesis suggests that our ancestors transitioned from an arboreal to a bipedal lifestyle and evolved in other key ways due to living in this type of relatively stable environment. Potts several years ago instead formulated a human evolution theory around "variability selection," which he explained "is a process linking adaptive change to large degrees of environment variability." 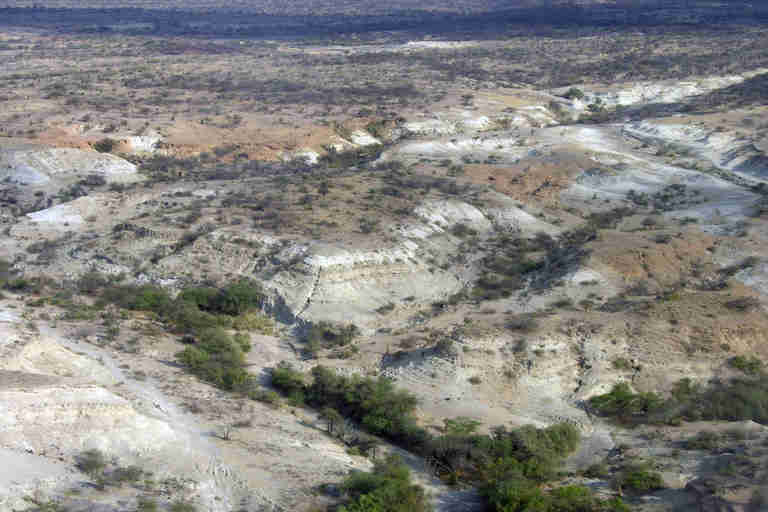 In the first of the three new studies, Potts and his team report that the Olorgesailie Basin — where hominids lived starting by at least 1.2 million years ago — was mostly floodplains until around 800,000 years ago. For the next several thousand years, an increasing pace of environmental change is seen in the geological record, such as through sediments and carbon isotopes of soil samples. "The region went from being a stable system to one with significant tectonic activity, land-lake oscillations, fire-reddened zones, and intense wet-dry fluctuations," Potts said. "These would have resulted in unpredictable food and water supplies that, in turn, would have led to populations attempting to expand their geographical range in search of resources." Some animals did not survive the period of instability. Many large-bodied grazing specialists, including some elephant and horse species, went extinct. "I refer to them as the 'large lawn mowers' of the time,'" Potts said, adding that a baboon, a big hippo, a zebra, some large wild pigs, and other animals also went extinct following the environmental changes. Absent those large creatures, related taxa with smaller body sizes emerged. The authors say this is another sign of climate variability. As for hominids, they could no longer stay in one place for a long time, which was a problem because of their reliance on bulky stone tools for survival. "What we see is the emergence of smaller and lighter tools, capable of easier transport," Potts said. "These gradually replaced the big, clunky Acheulean toolkit." This technological shift, marking the beginning of the Middle Stone Age, was previously thought to have happened around 280,000 years ago. While hominid populations throughout much of Africa appear to have held on to their Acheulean tools until that time, those in East Africa made the transition by at least 320,000 years ago. At this time, about 42 percent of the more refined tools were crafted from obsidian. 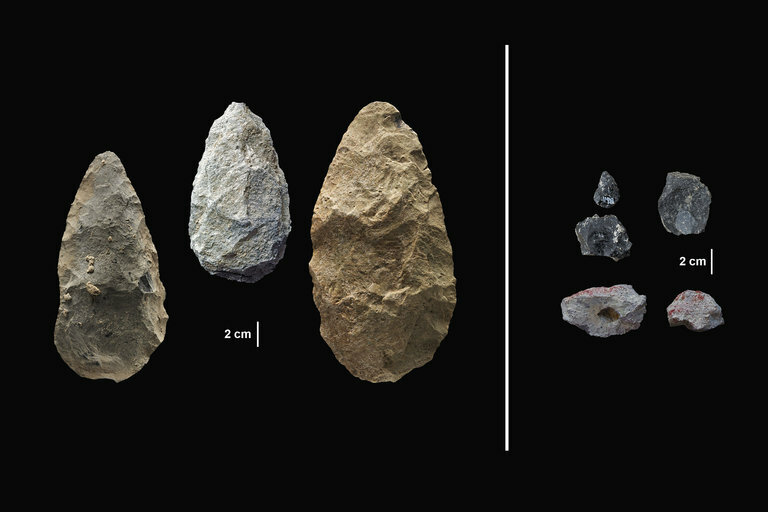 The second study, led by anthropologist Alison Brooks of George Washington University's Center for the Advanced Study of Human Paleobiology, provides more detail on the human-made artifacts excavated from the Olorgesailie Basin. She and her team surprisingly found that there is no local source there for obsidian, which means individuals must have traveled from around 16 to over 62 miles to obtain this coveted material. The shortest distance would have required scaling a mountain, Brooks said, making the trip all the more arduous. "Other people were also living where the obsidian was, so the travelers could not just take and grab it," Brooks told Seeker. "Instead, the humans of the Olorgesailie Basin must have made distant contacts, with whom they might have engaged in trade." "People at the time did not have money or animals to trade," she continued. "Friends were the real money in the bank." Before around 320,000 years ago, these populations were not yet Homo sapiens, the researchers believe. It is likely that they were Homo heidelbergensis, a species of our genus that once lived in not only Africa but also in Europe and western Asia. Fossils for Homo sapiens start to appear in Morocco around 315,000 years ago. A skull for Homo sapiens from Ethiopia dates to around 200,000 years ago, while a jawbone from our species excavated in Israel dates to about 180,000 years ago. As more fossils are found, it is likely that more will date closer to 320,000 years ago, coinciding with the environmental and technological changes that were also occurring at this time. As Brooks indicated, social changes were occurring too, and there are clues for this in the fossil record. 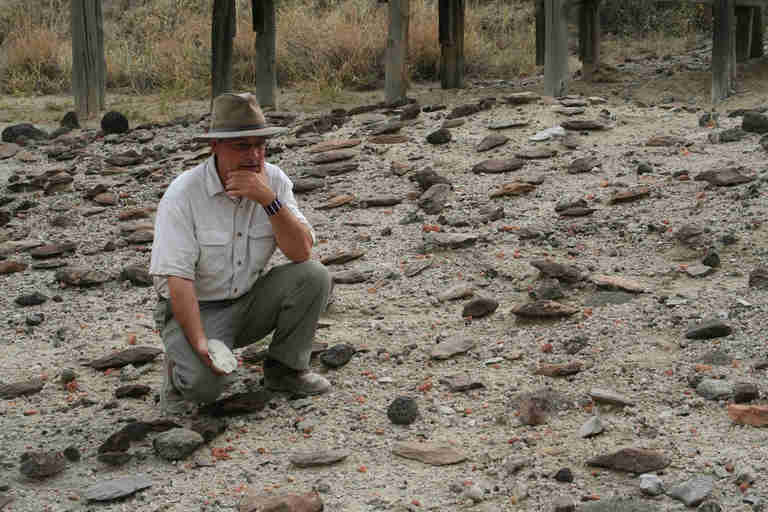 Brooks and her team report the discovery of two lumps of ochre that had been manipulated by humans. It looks as though someone ground portions of the ochre, which would have produced a bright red powder. "This powder could be mixed with anything — sweat, oil, water, fat — and produced a nice pigment," Brooks said. The early humans also appear to have created black (manganese), brown, green, and white pigments, and perforated a piece of ochre on opposite sides in order to possibly wear or carry the colorful rock. By 77,000–80,000 years ago, there is evidence that humans were wearing beads with ochre on them. 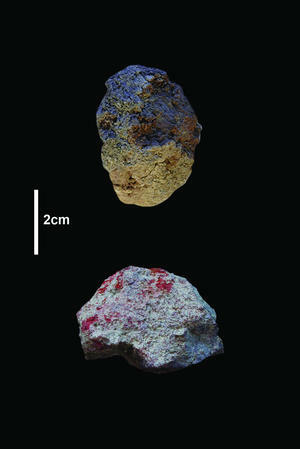 Neanderthals also appear to have used red ochre pigments by at least 250,000 years ago. Early humans could have applied color to signify their social networks. Potts pointed out that this still occurs today with flags, tattoos, hats, university t-shirts, and other visual signs of affiliation. "Placing color on skin, hair, and other parts of the body can be a symbolic behavior," Potts explained. "It can communicate, 'I'm part of a group that you know and you like us.'" Conflicts occur among hunter-gatherers, but since smaller populations were spread over vast distances in Africa, the researchers believe that warfare during these earlier periods of human history would have been inherently kept in check. This is not to say that the different hunter-gatherer groups did not have arguments. Spoken language cannot be preserved in the fossil record, save for evidence that a hominid possessed anatomy capable of speech. The researchers, however, suspect that the emergence of more complex social networks over longer distances and resulting symbolic behaviors would have advanced language evolution. extinct and replaced by smaller taxa, people appear to have relied more on small game. Brooks and her team found remains for antelopes, bat-eared foxes, springhares (a type of rodent), root rats, hoofed mammals such as pigs, and more. Brooks has studied hunter-gatherers in Africa for nearly two decades, and such groups today often consume such smaller game. It is therefore possible that the hunter-gatherer diet in Africa has not changed much over thousands of years. "Even to catch smaller animals you need snares, hooks, and other technologies," Brooks said, adding that some of these tools, such as rope, tend not to preserve well over the millennia. The third study, led by Alan Deino of the Berkeley Geochronology Center, provides detailed dating of sites within the Olorgesailie Basin. The work, based on argon and uranium dating methods, helps to elucidate the critical transition between the Acheulean period and the Middle Stone Age. Yet another related study is now in the works. Potts told Seeker that he and his team have drilled a large sediment core from a flat piece of ground in East Africa. "It provides a beautiful environmental record," he said. "This is an evolutionary story,” he added. “It's not that one day there was Homo heidelbergensis and the next day there was Homo sapiens. The changes happened over tens of thousands of years, and we can see this evolution occurring in East Africa."